The recent Edgbaston test brought 200 runs for Kohli, about 50 runs more than the whole of 2014 England tour. This is an amazing stat in itself. So what change did Kohli make? First of all, in the whole Edgbaston test, he stood a few inches outside his batting crease. How did it help him? By standing outside his crease along with the big stride in, he was able to negate the LBW decision going against him. Even when the ball hit him on the pads, he would be so far down the crease that Hawkeye would show the ball going over the stumps. I remember a Sam Curran ball hitting Kohli's pad, which looked pretty adjacent in the first place, but when England reviewed it, it was found to be going over the stumps. It must be said that batting outside one's crease is not an easy task because it requires quick reflex action as the ball has that much less distance to travel. Hence, a short pitch ball becomes more effective for a bowler when the batsmen are batting outside their crease. This is what Ben Stokes tried in his spell. But Kohli was up to the task and took Stokes for a few runs through his pull shot whenever Stokes tried to pitch the ball short. 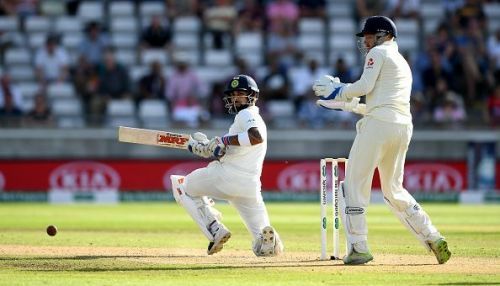 Kohli using his pull shot mainly happened in the first innings when he was batting with the tail and was looking for quick runs, but even in the second innings, his quick reactions made sure that he could leave those short balls with ease. Another change that brought Kohli success in this test was that he left a lot more balls. Leaving balls outside the off stump is an art in itself, which is such an important aspect for a test player. During the 2014 England tour, Kohli was chasing balls outside off stump, which resulted in him nicking balls to the slip cordon and getting out in the process. In the Edgbaston test, Anderson kept probing him with that outside off, but he countered that by leaving a lot more balls. And finally, another change that Kohli brought in his technique was that his head was not falling over. I have seen Kohli getting out LBW so many times in the past as his head would fall over when he tried to play the ball across. Kohli did follow this change for most of his innings, but when he finally made the mistake of his head falling over and playing across, he got out to Ben Stokes in the second innings. Kohli getting out at that moment was so crucial to England's fortunes, as India needed just 53 runs at that time with 4 wickets in hand. All in all, it must be said that Kohli is a thoughtful cricketer. He worked on his weaknesses and had a clear strategy in mind on how to play in England conditions. He is going to be such an important part of this India team for the rest of the four test matches.